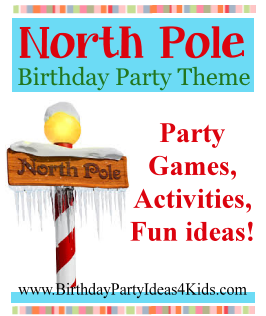 Fun ideas, games, activities and more for a North Pole themed birthday party! It's every child's dream to spend a day at the North Pole with Santa, the elves and reindeer! Make their dreams come true with these fun party ideas. Teams must make it across the playing field by using only pieces of poster board. Cut large ice burg shapes from paper about 10 x 12 inches each. Teams are given one more iceberg them the total number in their team. Tell the teams they can only use the icebergs given to them to get from one end of the room to the other. Teams use the iceberg pieces to move by having players stand on the ice burgs all together. Then they take the back ice burg and move it to the front of the line and so on. If a player steps off the ice burg into the water they all go back and begin again. Are their chopsticks at the North Pole? Why, yes there are! Guests move cotton balls (snowballs) from one bowl to another bowl using only chopsticks ... while blindfolded. For team play set out two bowls for each team. Fill teams bowls with equal number of cotton balls. Give teams a set of chopsticks and a blindfold. They have to transfer the cotton balls into the other bowl. This is harder then it looks! When one player has finished transferring all the balls the next player in line puts on the blindfold and continues until everyone on the team has completed the task. Fun relay style game using foam peanuts and a broom. Mark white foam peanuts with different colors to distinguish between teams. Divide guests into teams. Each team gets the same number of foam peanuts (25 or more) and a broom. One at a time the players from each team must sweep their peanuts around the playing area and back again. This game is more challenging and fun when played on a smooth floor ... and really funny when a ceiling or stand up fan is place at the turn around point! Variation: Use 3 ping pong balls instead of the Styrofoam peanuts. Played just like the Pin the Tail on the Donkey party game. Instead of a Donkey have the guests pin the nose on the snowman, or pin the red nose on Rudolf the Red Nose Reindeer. This is how elves go fishing at the North Pole! Tie the string to one end of the stick. Tie the other end of the string to the bottom of a large candy cane so when it is hanging from the string it forms a hook. Place several large candy canes in a container that will allow them to stand upright and still have the tops of the candy canes exposed. Players fish for candy canes by trying to hook one of the candy canes in the container on the floor with their candy cane “hook”. Send party guests on a Christmas scavenger hunt. The Christmas scavenger hunt list is filled with fun items to find and is free to print out for your party! Let the party guests paint a small paper or wooden ornament to take home as a party favor. Or buy small wooden toys or trains that the guests can paint and take home. Let guests build and decorate their own gingerbread house. There are many gingerbread kits out now that contain 4 small gingerbread houses that you can buy, or simply use squares of graham crackers and frosting (2 lbs. powdered sugar, 6 egg whites, 1 tsp. cream of tartar - mix together with an electric mixer). Set out bowls of small candies like skittles, dots, gumdrops, etc. to decorate the houses. This activity is better when done at the beginning of the party so the houses will have time to dry a little before they are taken home. Decorate using red, white and ice blue with touches of Christmas green. Red and white striped table cloths with ice blue flatware, napkins, cups and plates. Or red and white polka dotted table cloths! Make several signs that point the way to the party areas. Reindeer games could be where you will play the party games. Santa's Workshop for a party craft or activity and Mrs. Claus kitchen for cake and other treats. A fun idea for a candy buffet would be a reindeer food theme! Along with glass candy jars include wooden boxes or bowls. At each place setting set out an elf hat that the party guests can wear during the party.